For Jewelry: Wipe Clean, keep dry, do not expose resin jewelry to extended amounts of strong sunlight, and store in a dark, dry place. Please be sure to treat it kindly. It's recommended to remove earrings and jewelry before showering, swimming, etc. Earrings and necklaces should be stored in the box they arrived in or other enclosed jewelry box to avoid tarnish. Understand some materials used must be treated with a certain amount of respect, always see descriptions and TLE Creation Stories. My Jewelry is surprisingly lightweight, but also strong enough to fancy dance at any Pow Wow's Grand Entry! And that is strong! All jewelry created has been medicine man approved by my Ojibwe local healer and I have his blessing to create. Please label and link with love! Every piece of work I create is a one of a kind statement! I source all my materials and supplies responsibly to maintain ethnical standards. I source directly from local businesses from my Rez to Online Indigenous Crafting Sites to United States Jewelry Companies. I go out of my way to ensure the materials I used are sold in the right way. I was taught to bring good energy into every step of my process and production, from the sketch pad to the work bench to your hands. Semaa, or tobacco, is one of the four sacred plants. An offering of Semaa is always made before announcing my intentions and taking. It is my way of giving back and thanking. The Quills are collected a few ways: the natural life process of a deceased animal (roadkill), donations (others finding a deceased animal), and most likely from other Native-supporting/Native-owned businesses. The Shells are collected either from other Native-supporting/Native-owned businesses or through online businesses specializing in shells for jewelry. 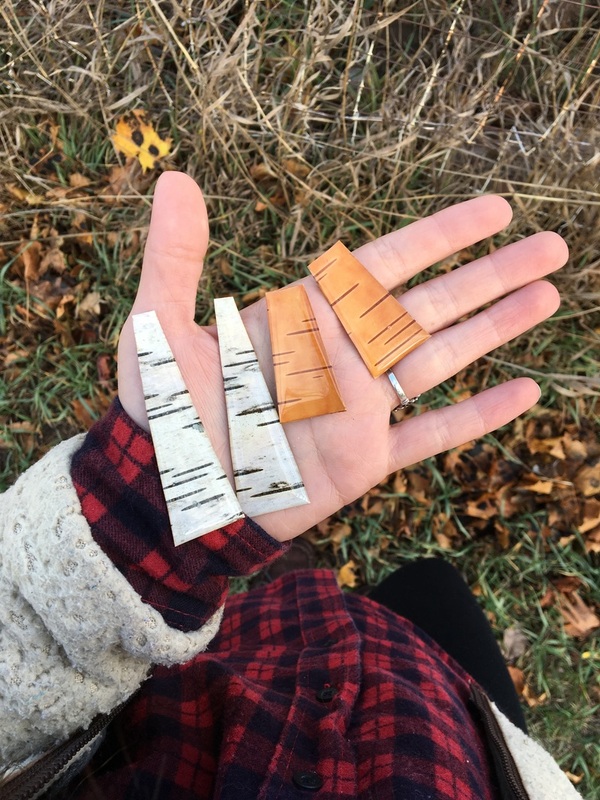 The Birch bark is sourced in a respectful and meaningful way, during the winter months it is mostly picked off the ground. Because of the remarkable preservative properties of birch bark, it can be harvested from dead or fallen trees. The Four Medicines are collected from locally or from other Native-supporting/Native-owned businesses. These are our scared medicines holding and keeping our connection to Mother Earth and although they have more specific meanings from first Nation to first Nation, we must understand and be mindful they represent the stories of resilience, past, present and toward the future. I don't use these medicine to seek profit, but share them in confidence for each individual's own healing journeys. I want to make our medicines accessible to all and give back sovereignty to your own healing. Straight from the earth, slow medicine. 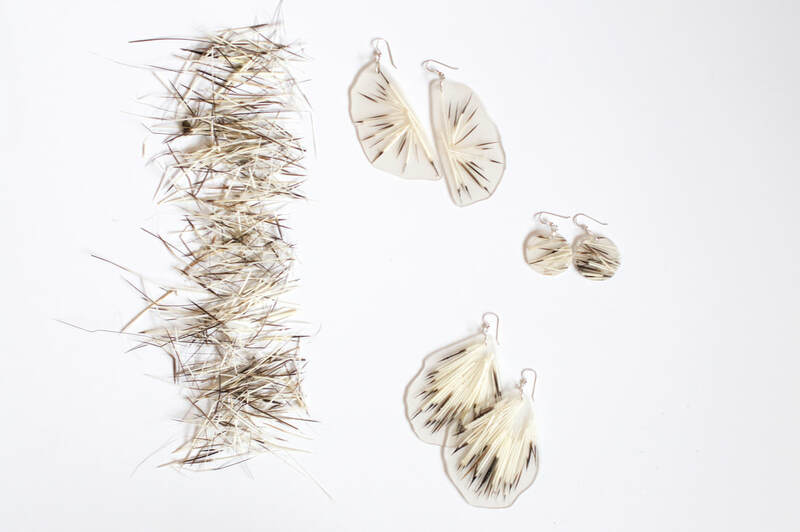 The metal earring and jump-rings are Sterling Silver assembled in the USA. Why the Porcupine has Quills Long, long ago, the Porcupines had no quills. One day, a Porcupine was out in the woods. A Bear came along and would have eaten Porcupine, but he managed to get up a tree where the Bear couldn't get him. The next day Porcupine was out again and he went underneath a hawthorn tree, and he noticed how the thorns pricked him. He broke some branches off and put them on his back, then he went into the woods. Along came Bear and he jumped on Porcupine, who just curled himself up. The Bear just left him alone because the thorns pricked him so much. Wenebojo was watching them. He called to Porcupine and asked "How did you think of that trick?" Porcupine told him that he was in danger when Bear was around. Then Wenebojo took some thorns and peeled the bark off of them until they were all white. Then he got some clay and put it all over Porcupine's back and stuck the thorns in it. Wenebojo used his magic to make it into a proper skin, and told Porcupine come with him into the woods. When they got there, Wenebojo hid behind a tree. Wolf came along and saw Porcupine and jumped on him, but the new quills pricked at him and Wolf ran away. Bear was also afraid of the quills and Porcupine was safe. That is why Porcupines have quills. The Ojibwe people always had stories to tell that had a moral. A main character who was always used was Waynaboozhoo. But it is told that you cannot tell a Waynaboozhoo story in the spring, summer, or fall, only when there is snow on the ground or it is said that a frog will be in your bed. You can put down cedar and ask to tell the story and nothing will happen to you or your bed. This is what I am told. Now this is the story about how the birch bark got its burns. Often stories have different morals or different explanations so this one may be somewhat different from others that you have heard. It was wintertime and Waynaboozhoo's grandmother called him to her. "Waynaboozhoo, omaa bi izhaan!" she called. "Come here. It is cold and we have no fire for warmth or to cook and prepare our food. I ask of you to go to find the fire, ishkodence, that Thunderbird has in the west." "Grandmother," Waynaboozhoo replied. "I will go and look for the great ishkodence for you." He disguised himself as a waboos, a little rabbit, and headed off to the west looking for the fire. When Waynaboozhoo finally reached Thunderbird's home, he asked, "Please share the warmth inside your home. I am cold and lost. I will only stay a little while, for I must be on my way." The Thunderbird agreed and allowed Waynaboozhoo to enter his home. Inside, Waynaboozhoo saw the fire and waited until Thunderbird looked away. Then, Waynaboozhoo quickly rolled in the fire and took off running toward his home with the fire on his back! Thunderbird flew behind Waynaboozhoo throwing lightning flashes at him! Waynaboozhoo grew tired and yelled for someone to help him. "Widoka! Widoka washin! Help me!" he cried. Then omaaî mitig, the birch tree, spoke. "Come, hide beside me my brother. I will protect you." The little waboos hid beneath the tree while Thunderbird flashed and thundered, angry that Waynaboozhoo had stolen the fire. The lightning bolts missed Waynaboozhoo every time but they hit omaaî mitig. Dark burn marks scarred the white bark of the tree. That is why the birch tree now has burn marks on its bark. The information stated is only a small portion of the many and extensive Native Teachings that exist. Teachings vary from First Nation to First Nation and even from one geographic region to another. For more information, please consult with a Traditional Elder, Healer or Medicine Person. Native American tribes are very diverse. Cultural teachings, philosophies, and social dynamics differ greatly from one tribe to another. Even within one tribe, stories and teachings may vary from region to region. The teachings shared in the Kinoomaagewin Mzinigas (Little Teaching Books) and Traditional Teachings and Other Brochures (Anishnawbe Health Toronto (AHT)) may be presented differently in other areas. Tobacco is the first plant that the Creator gave to Native people. It is the main activator of all the plant spirits. Three other plants, sage, cedar and sweetgrass, follow tobacco, and together they are referred to as the four sacred medicines. The four sacred medicines are used in everyday life and in ceremonies. 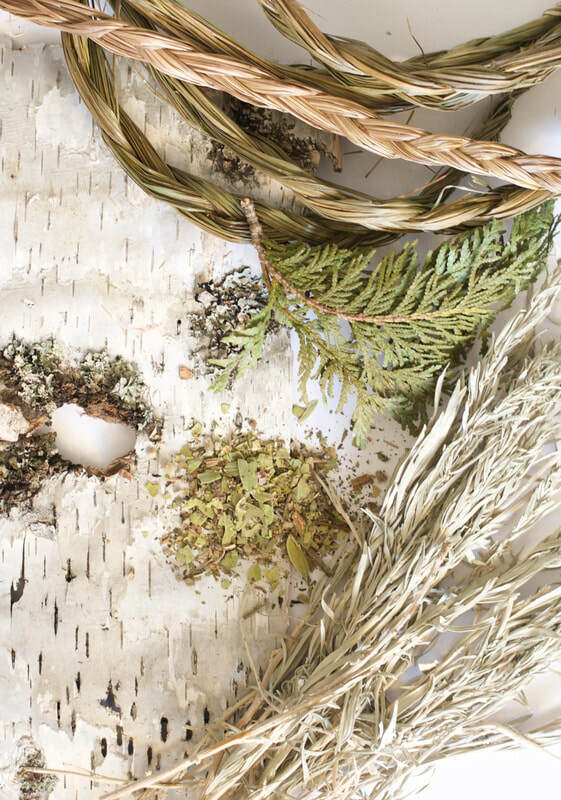 All of them can be used to smudge with, though sage, cedar and sweetgrass also have many other uses. It is said that tobacco sits in the eastern door, sweetgrass in the southern door, sage in the west and cedar in the north. Elders say that the spirits like the aroma produced when we burn tobacco and the other sacred medicines. Asemaa - Waabanong (East) Sacred tobacco was the first medicine given to the Anishinaabe and is an important offering or gift used in ceremonies to link our communications with the Spirit world. It is offered to the fire, so the smoke can lift prayers to the Creator. Traditional people say that tobacco is always first. “Always through tobacco,” the saying goes. Culturally, asemaa was, and is, a sacred plant used for spiritual, emotional, mental and physical guidance. It is understood that if used in positive ways it has the power to heal and protect. When you offer tobacco, you explain your reasons to the Creator for taking a harvest. For example, asemaa is offered when taking anything from the earth, in hunting, fishing, harvesting wild rice, berries, medicines and other plants. Asemaa is often offered at the beginning of an event to bless it, this ensures that things are done "in a good way." Many offer asemaa daily with prayers of thankfulness. Elders say hold it in your left hand as that is the hand closest to your heart. Tobacco has a special relationship to other plants: it is said to be the main activator of all the plant spirits. It is like the key to the ignition of a car. When you use it, all things begin to happen. Tobacco is always offered before picking medicines. When you offer tobacco to a plant and explain why you are there, that plant will let all the plants in the area know why you are coming to pick them. When you seek the help and advice of an Elder, Healer or Medicine Person, and give your offering of tobacco, they know that a request may be made as tobacco is so sacred. It is always good to offer Asemaa to an elder when seeking knowledge or their advice. We express our gratitude for the help the spirits give us through our offering of tobacco. Mashkodewashk - Ningabii-anong (West) White sage is used to prepare our people for ceremonies and receptivity to teachings. Stems of the sacred Mashkodewashk are tied together in bundles and carried by the Anishinaabe. The use of white sage can be done in many ways, including smudging which is for cleansing and releasing troubling feelings. Some will use Sage to purify ceremonial objects, places and the body. Cleansing the body consists of smudging the five sensory organs, the head, the feet and the back. Hands: To cleanse what we touch and to touch all things in a gentle and kindly way. Eyes: To cleanse our sight so we see all things that are good and to look at others in a kind way. Nose: To cleanse our sense of smell so we know the things around us through scent. Ears: To cleanse our ears so we can listen to all things in good way and hear the good ness even through any negative speaking. Mouth: To cleanse our words so that we may speak in a kind and non-judgmental way. Head: To cleanse our mind so we may think clearly and in a kind and gentle way. Feet: To cleanse our steps so that we may step lightly and kindly on our Mother, the earth. Back: To cleanse our troubles and lift the weight away. Mashkodewashk is a perennial in the Aster Family that grows best in sunny locations such as in dry prairies or along roadsides. At times when white sage might not be available, pearly everlasting, Anaphalis margaritacea, also in the aster family, but not as aromatic, may be substituted. Giizhik - Giiwedinong (North) White-cedar is a tree with many important uses in traditional Ojibwe culture. Honored with the name Nookomis Giizhik ("Grandmother Cedar"), the tree is considered a gift to humanity for its many uses, among them construction, medicine and crafts. Elders say put some in your shoes and goodness will come your way. When cedar mixed with tobacco is put into a fire it crackles; this is said to call the attention of the Spirits (Manidoog) to the offering that is being made. Cedar is used in sweat lodge for protection as it is a guardian spirit and will chase away bad spirits. As with sage and sweetgrass, cedar is used to purify the home; it also has many restorative medicinal uses. When combined with sage for a tea, it clears the body of all infections. White-cedar foliage is rich in Vitamin C and can be steeped in hot water for a delicious tea. Due to the presence of the neurotoxic compound thujone, internal use can be harmful if used in strong doses for prolonged periods. Northern white-cedar grows naturally in wet forests, being particularly abundant in coniferous swamps. Northern white-cedar can be a very long-lived tree with notably old specimens growing on cliffs where they are inaccessible to deer and wildfire; the oldest known living tree is over 1,100 years old. The Witch Tree, a cedar growing out of a cliff face on Lake Superior in Minnesota, was described by the French explorer Sieur de la Verendrye as being a mature tree in 1731; it is still alive today! Wiingashk - Zhaawanong (South) Sweetgrass is the sacred hair of Mother Earth. Her sweet aroma reminds our people of the gentleness, love, and kindness she has for the people. When sweet grass is used in a healing circle it has a calming effect and returns our thinking to goodness. Like sage and cedar, sweetgrass is used for smudging and purification. When braiding sweetgrass, each of the three woven strands represents the union of body, mind and spirit — or the love, peace, and harmony that connect us to the land. Each strand alone is not as strong as when all three are braided together. The Anishnaabe People follow very sacred traditions and believe that when one takes something from the Earth - for example, when sweet grass is picked - then an explanation to the spirit about why it is being picked and how it will be used is required. The explanation is often accompanied by an offering of tobacco in return for the generosity shown by the Earth and the plant which shared itself. Wiingashk grows best in moist soils receiving generous sunlight. The shiny leaves give off their fragrance best when dried. To help you identify Wiingashk run your fingers from leaf tip toward the root, your fingers will feel some resistance as they glide across the nap. From root toward tip the blades of sweet grass will feel very smooth. You take care of these sacred medicines by keeping them in a dry place. They can be stored in paper bags or wooden boxes. If you have been using alcohol or drugs, Healers say you should wait four to seven days before touching the medicines. As our awareness and knowledge of our traditions and culture increases, so does our honour and respect for these ways. This has not always been the case in our communities. There are always those who present themselves as Healers, Elders or Medicine People who have not earned that title and may use the teachings and medicines in the wrong way. It is important for everyone, especially young people, to be aware of this and to exercise caution when they seek healing, teachings or advice. It is advisable to consult with people whom you trust to get referrals to respected and recognized Traditional Elders, Healers or Medicine People. Stories were shared with me, as well as with my community, from the KBIC Natural Resource Department.